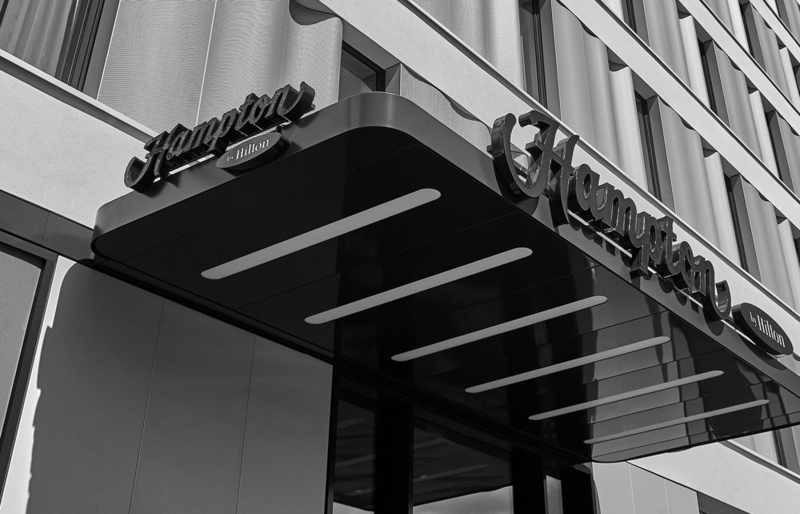 amp created the official Hampton by Hilton Sound DNA, deriving exclusive music productions from it. Hampton is the friend who helps you journey on. "We Go Together", Hampton's official Sound DNA, establishes a musical language for ATL communication. The first implementation took place in a TV campaign with several commercials across the USA. “amp’s expertise of audio branding is extensive and their key partnership strengthened the brands in understanding human archetypes in their correlation to music"
Hilton Worldwide Holdings, Inc. (formerly Hilton Hotels Corporation) is an American multinational hospitality company that manages and franchises a broad portfolio of hotels and resorts, founded by Conrad Hilton in 1919. As of October 2016, its portfolio includes 4,820 properties (including timeshare properties) with 788,864 rooms in more than 100 countries and territories. Hilton Worldwide has 14 brands across different market segments including Conrad Hotels & Resorts, Canopy by Hilton, Curio - A Collection by Hilton, Hilton Hotels & Resorts, DoubleTree by Hilton, Embassy Suites Hotels, Hilton Garden Inn, Hampton Inn, Homewood Suites by Hilton, Home2 Suites by Hilton, Hilton Grand Vacations and Waldorf Astoria Hotels & Resorts.